The red, permanent adhesive Labels 3456 in the format 105x148mm Avery suitable, for example for colored identification of stock. 400 labels on 100 sheets. You can rely on an absolutely jam-free printer throughput without glue deposits on the printer. 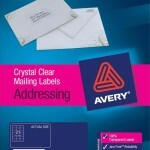 Design and print your labels quickly and easily – with the free Avery labels templates and software solutions under www.avery-zweckform.eu/print or the built-in Microsoft® Office package based templates. 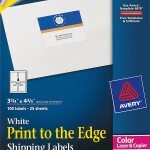 Colored labels suitable for all standard ink / laser and inkjet printers and copiers. 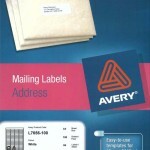 The blue, permanent adhesive Labels 3457 in the format 105x148mm Avery suitable, for example for colored identification of stock. 400 labels on 100 sheets. You can rely on an absolutely jam-free printer throughput without glue deposits on the printer. Design and print your labels quickly and easily – with the free Avery labels templates and software solutions under www.avery-zweckform.eu/print or the built-in Microsoft® Office package based templates. Colored labels suitable for all standard ink / laser and inkjet printers and copiers. The green, permanent adhesive Labels 3458 in the format 105x148mm Avery suitable, for example for colored identification of stock. 400 labels on 100 sheets. You can rely on an absolutely jam-free printer throughput without glue deposits on the printer. Design and print your labels quickly and easily – with the free Avery labels templates and software solutions under www.avery-zweckform.eu/print or the built-in Microsoft® Office package based templates. Colored labels suitable for all standard ink / laser and inkjet printers and copiers. The yellow, permanent adhesive Labels 3459 in the format 105x148mm Avery suitable, for example for colored identification of stock. 400 labels on 100 sheets. You can rely on an absolutely jam-free printer throughput without glue deposits on the printer. Design and print your labels quickly and easily – with the free Avery labels templates and software solutions under www.avery-zweckform.eu/print or the built-in Microsoft® Office package based templates. Colored labels suitable for all standard ink / laser and inkjet printers and copiers. The white, self-adhesive filing labels L6060-100 in the format 34x192mm from AVERY ZWECKFORM stick reliably on all standard slim folders. 800 short filing labels on 100 sheet per pack. The completely opaque filing labels cover old writing and labelling reliably for a clean organization. You can rely on jam-free printing with no adhesive residues left in the printer. Trouble-free printing for laser printers tested and certified by TÜV SÜD. Environmentally-friendly, FSC® certified and chlorine-free bleached. 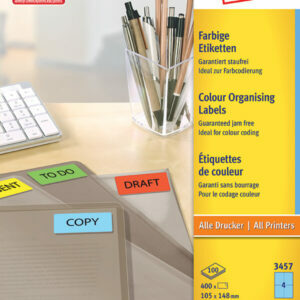 Design and print your filing labels the quick and easy way – for the free Avery Zweckform templates and software please visit www.avery-zweckform.eu/print or use the templates integrated in the Microsoft® Office packages. Optimum suitability for inkjet-, laser- and colour-laser printers. The white, self-adhesive filing labels L6061-100 in the format 59x192mm from AVERY ZWECKFORM stick reliably on all standard wide folders. 400 short filing labels on 100 sheet per pack. The completely opaque filing labels cover old writing and labelling reliably for a clean organization. You can rely on jam-free printing with no adhesive residues left in the printer. Trouble-free printing for laser printers tested and certified by TÜV SÜD. Environmentally-friendly, FSC® certified and chlorine-free bleached. Design and print your filing labels the quick and easy way – for the free Avery Zweckform templates and software please visit www.avery-zweckform.eu/print or use the templates integrated in the Microsoft® Office packages. Optimum suitability for inkjet-, laser- and colour-laser printers. The white, self-adhesive filing labels L4760-100 in the format 38x192mm from AVERY ZWECKFORM stick reliably on all standard slim folders. 700 short filing labels on 100 sheet per pack. The completely opaque filing labels cover old writing and labelling reliably for a clean organization. You can rely on jam-free printing with no adhesive residues left in the printer. Trouble-free printing for laser printers tested and certified by TÜV SÜD. Environmentally-friendly, FSC® certified and chlorine-free bleached. 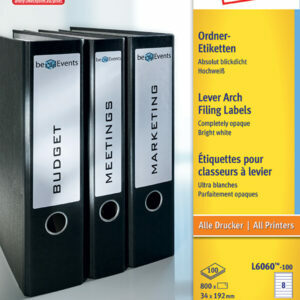 Design and print your filing labels the quick and easy way – for the free Avery Zweckform templates and software please visit www.avery-zweckform.eu/print or use the templates integrated in the Microsoft® Office packages. Optimum suitability for inkjet-, laser- and colour-laser printers. 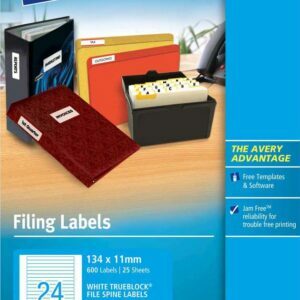 The white, self-adhesive filing labels L4761-100 in the format 61x192mm from AVERY ZWECKFORM stick reliably on all standard wide folders. 400 short filing labels on 100 sheet per pack. The completely opaque filing labels cover old writing and labelling reliably for a clean organization. You can rely on jam-free printing with no adhesive residues left in the printer. Trouble-free printing for laser printers tested and certified by TÜV SÜD. Environmentally-friendly, FSC® certified and chlorine-free bleached. Design and print your filing labels the quick and easy way – for the free Avery Zweckform templates and software please visit www.avery-zweckform.eu/print or use the templates integrated in the Microsoft® Office packages. Optimum suitability for inkjet-, laser- and colour-laser printers. This is the mark of a true professional. Use these White File Folder Labels with TrueBlock® Technology to give ordinary folders a clean, organized look that’s easy to identify. These innovative labels are designed to completely cover everything underneath, from markings to old, existing labels. 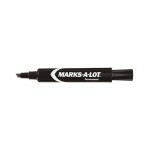 Plus, these labels are guaranteed to stick and stay, without curling or lifting. 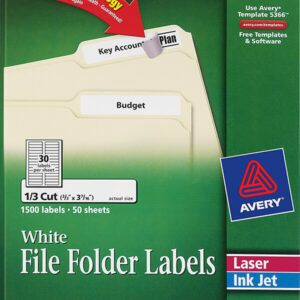 And with free templates from avery.com you can put smart label design in plain view, or add your own custom colors to create your own filing system. Simply type in text to identify folders or documents. 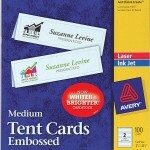 After printing with a laser or inkjet printer, you’ll have professional-looking labels that you can spot right away. Hunting for missing documents can be a real time waster. But you can speed up the process by keeping on top of filing and making sure that all your files are labelled correctly. Taking a bit of time to create your labels is a great way to save you and your colleagues’ time. These filing labels are for elasticised folders and can be personalised with the folder contents. Whatever you are filing you can create printed labels so they are easy for everyone to read. It really will impress your colleagues! End of year filing can be so time-consuming and sometimes stressful, especially when there’s lots of other jobs to do. What you need is something that will speed up the process. Filing labels for a laser printer are just what you need. They are great for when you have larger amounts of filing to do. 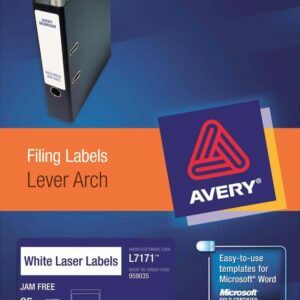 It’s easy: just create all your labels in advance using the free Avery® software and templates, print them out and apply to your lever arch files. Apply the labels over another label and nothing will show through! Hunting for missing documents can be a real time waster. But you can speed up the process by keeping on top of filing and making sure that all your files are labelled correctly. Taking a bit of time to create your labels is a great way to save you and your colleagues’ time. These filing labels are for ring binders and can be personalised with the folder contents. Whatever you are filing you can create printed labels so they are easy for everyone to read. It really will impress your colleagues!